tradition, some believing that twins brought good fortune, and others that twins were evil omens. Generally those seeing twins as evil are the older traditions. Orisa Ibeji was the deity protector of twins, and harming a twin might bring down his wrath. One common element of the traditions is that it is important to treat twins well, offering them special treatment. 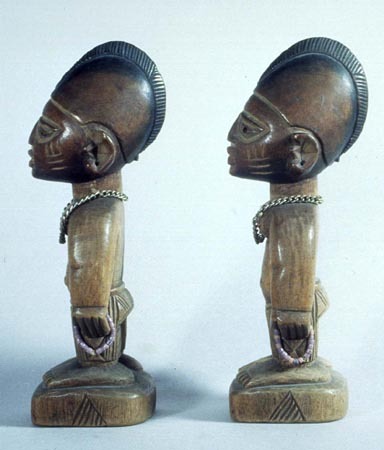 The Ibeji tradition seems to originate with a story that twins were first brought to the Yoruba by monkeys. One tradition has it that only monkeys had twins before that, and that it was a punishment.